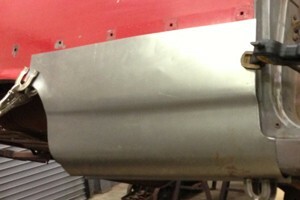 This is the lower front of the 63 Galaxie Dog leg. This panel fits into the door opening and goes back and includes the rear wheel opening in front of the rear wheel. This is for the 2 door model but can be cut for the 4 door.